Locals are struggling to get rid of the explosive booby-traps the Islamic State left as they withdrew from Ramadi. For one group of daring locals, defusing the bombs has become a lucrative new job opportunity. In the central Iraqi city of Ramadi, it is no longer unusual to see individuals who look like ordinary civilians dismantling improvised explosive devices left behind by extremists as they withdrew from the city late last year. In fact, the extremist group known as the Islamic State, or IS, left behind so many improvised explosive devices, or IEDs, that the military and local security authorities don’t have the manpower or time to defuse them all. And locals, who know their way around a bomb, have been quick to take up the slack. Some of them are former members of the military, others are moonlighting from the police or army to make some extra money and some are ordinary civilians with mechanical or engineering backgrounds who have learned how to defuse the IEDs, often using less sophisticated methods than dedicated bomb squads. 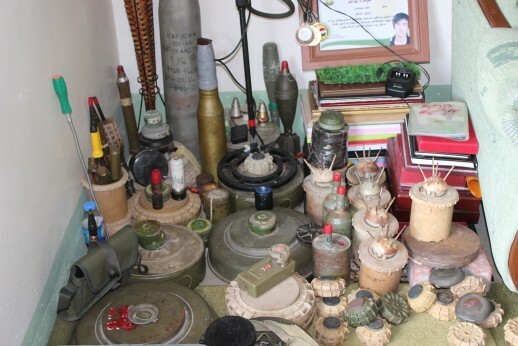 Faleh al-Marsoumi got involved in the lucrative new trade because it was taking far too long for authorities to come to his home and remove the booby trapped explosives. The usual procedure involves asking engineers who work for the local authorities to come and dismantle the dangerous devices. Having heard that there were unofficial bomb disposal experts now working in the city, al-Marsoumi decided to pay one of these to clear his property. He had heard that the bomb disposal crews gathered on the outskirts of the city and that one could request them to come and work, in a similar way that one could employ freelance construction workers and manual labourers. “I asked taxi drivers and store owners near where the disposal experts were supposed to gather but they were all afraid to introduce me to these specialists because what they do is against the law,” al-Marsoumi says. Unable to find any of them al-Marsoumi decided to educate himself. “I watched some videos on the Internet about how to remove IEDs,” he says somewhat ingenuously about how he learned the job; he was actually already working in electrical engineering, at a generator repair workshop in the central city so he had some experience in the field. Al-Marsoumi started by removing the IEDs he found on his property and then helped out friends in their houses. Eventually he began charging for his services – and this has proven so lucrative that he quit his repair job and now IED disposal is his only work. To clear a house the team charge between US$300 and US$700. Clearing a car of IEDs costs US$200. “We work in three stages,” al-Marsoumi explains. “First we go and inspect the site, then we find the explosives, then we defuse them. The property owner is responsible for calling the security forces to take away the components and the actual explosives and bury them. Even with our primitive equipment we have been able to defuse around 1,500 IEDs. This is a noble profession,” al-Marsoumi concludes. It’s also a dangerous job and at the moment it is not legal either. But al-Marsoumi and others who work defusing IEDs believe that it might not be against the law for long. They are talking about founding their own companies as soon as the government does what they believe it will do, and privatizes the tasks. “We know that local authorities and the central government have been negotiating with international specialists and we believe it is going to become legal for Iraqis too,” al-Marsoumi explains. Another Ramadi man doing this job is 53-year-old Amir al-Suwaydawi. He used to serve in the Iraqi army under Saddam Hussein but was one of those who lost their jobs after the US-led invasion of Iraq, when the army was largely disbanded. When the extremist IS group were first driven out of Iraq, al-Suwaydawi used to help guide military engineers to where the IEDs were hidden. Many of these were former colleagues. However, when he saw how the various engineering teams worked, watching how they dismantled the IEDs, he realized he could do the job too. He also realised it could provide him with a new source of income. Al-Suwaydawi describes himself as “a good magician”, removing the effects of “black magic” in his home town. Having the support of their own tribes is very important to those who work defusing IEDs. Society in Anbar is dominated by tribal customs, clan connections and tribal justice. This means that if, for example, a member of one tribe hurts or kills, or damages the property of, the member of another tribe, then there must be some sort of retribution, often financial. Tribal connections are an important safety net for the men doing this work, in case they make a mistake or fail to defuse an IED properly. Another of the men working in the defusing trade is moonlighting from his regular job with the local police. The man, who wished to be known only as Abu Haffar (in English, the master of digging), said he enjoyed his part-time work a lot because he didn’t have to take orders and there were no set routines. It takes a toll; Abu Haffar points out he knows that some of the other people working in this sector have to take drugs to steady their nerves. Without them they wouldn’t be able to work, he adds. “It’s a dangerous adventure, this job,” he concludes.